One of the great things to do this summer, a nice visit to the Lycksele Zoo,(http://www.lyckseledjurpark.com) to check out the animals. Just to brag with my little Swedish, and to improve your vocabulary also, an animal in Swedish is called djur. Sweden has a wide variety of animals that can be seen in summer or winter and others can be seen all year round, adjusting to the changing weather by growing and shedding off fur. While others hibernate through the winter instead, pretty cool. (All pictures taken by either Santino or Stina). …and we got to see a real live Wolf..much bigger than your average dog…The wolf was one of the first animals to migrate into Sweden after the ice age. I’ ve always admired Bears, mostly because I only saw them on TV and I’ m sure there are none in Africa. Just like many Swedes , the bear loves berries that’s why its much nicer to see one inside a zoo than in the woods next time you go enjoying nature and picking berries. …and everybody loves little bear cubs…most people like them as teddy bears and love to cuddle with them…but in real life these little cute cubs have sharp claws and teeth…but still quite playful and fun to watch. …though Big and Strong..this is not an Älg…just borrowing some genuine Älg horns …for an amazing camera angle taken by my dear and lovely Stina. The elk is the biggest terrestrial mammal in Sweden. It is spread all over the country except for Gotland witha current estimated population of 300 000 animals.They are also known as Moose or Elk. For now you get to see only the horns, for more Älg body parts you can visit Lycksele Zoo or visit their website, which you will find above. The literal meaning of the Swedish term, allemansrätten, is ‘everyman’s right’. This refers to The Right of Public Access, which is a right for everybody. The Right of Public Access is a unique right to roam freely in the countryside. But with the right come responsibilities – to take care of nature and wildlife and to show consideration for landowners and for other people enjoying the countryside. The Swedish Environmental Protection Agency sums up the Right of Public Access in the phrase ‘Don’t disturb – Don’t destroy.’ And one of the best places to enjoy this right is to be in North Sweden in summer. Umgransele is really cool. 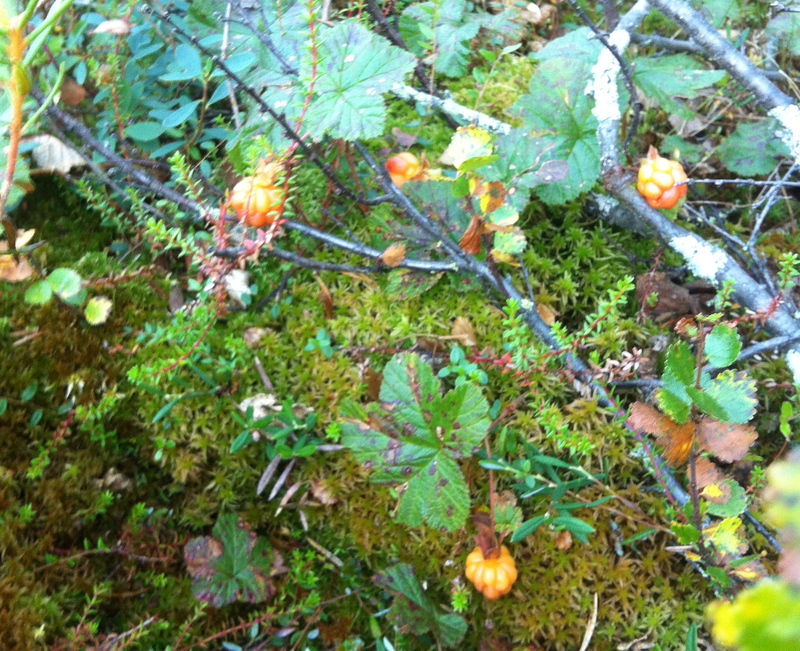 So we set out recently to enjoy the right of public access by gathering berries in the forest. 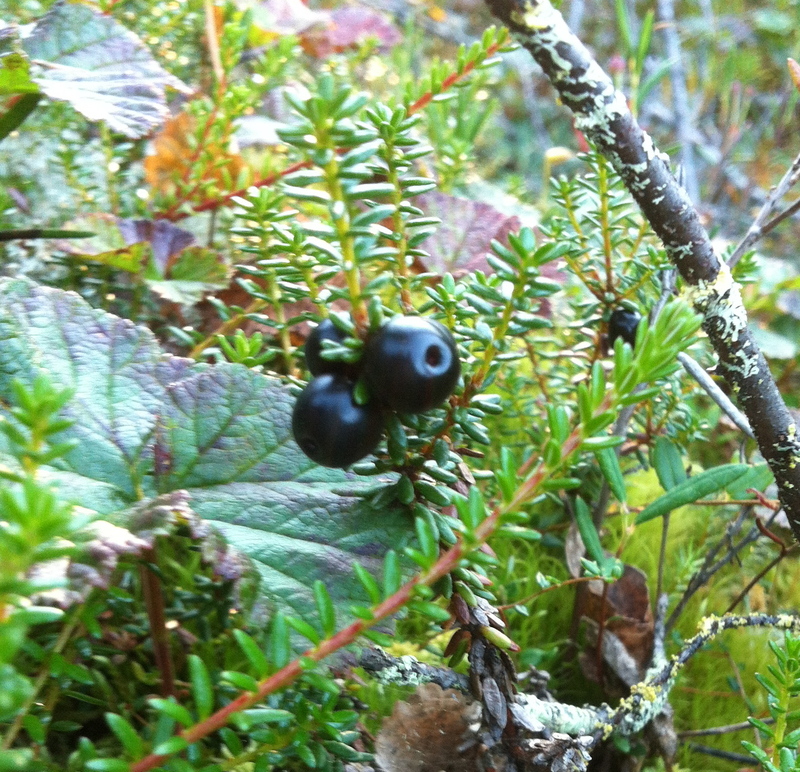 The north is filled with different varieties of berries: lingon, blåbär (blue berries), kråkbär (crowberries), hjortron (cloudberries), and of course jordgubbar (strawberries), hallon (raspberries), röda vinbär (red currants), svarta vinbär (black currants), björnbär (blackberries) which you can easily find in most gardens in swedish backyards. Berries grow so abundantly in summer they attract some big companies who employ migrant pickers seasonally from as close as West European countries like Poland to as far away as Thailand to pick berries from these same forests, of course using Allemansrätten. And so Santino, Stina, Christer and little Loke set out to pick hjortron in the nearby forest, a great summer excursion. We headed to a nice little spot in the woods where our eyes met with the hjortron; golden-yellow colored sticking up from the low bushes like tiny street lamps for the creeping insects and bugs below them. Hjortron can withstand cold temperatures down to well below -40°C.The ripe fruits are soft and juicy, and are rich in vitamin C. When eaten fresh, hjortron have a distinctive tart taste. When very-ripe, they have a creamy texture somewhat like yoghurt and a sweetened flavour. They are often made into jams, juices, tarts, and liqueurs. In Sweden, hjortron and hjortron jam are used as a topping for vanilla ice cream, pancakes, and waffles. 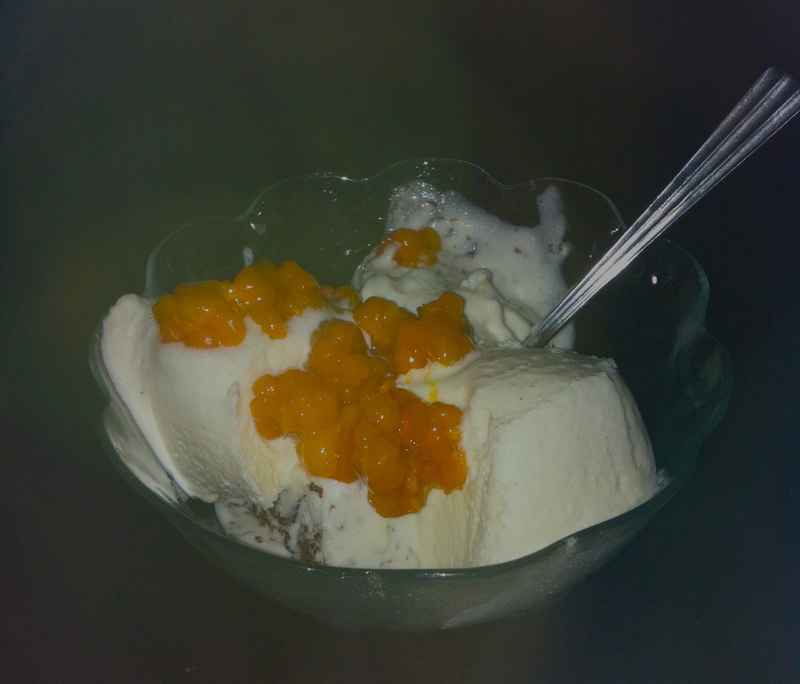 In Norway, they are often mixed with whipped cream and sugar to be served as a dessert called “Multecreme” (Cloudberry cream), as a jam or even as an ingredient in homemade ice cream.There are many benefits from living North of Sweden where hjortron is also referred to ”Norrlandsguld” ( the gold of the north). While in the south hjortron is a special delicacy usually found in 3 star restaurants (some say), in the north it is enjoyed freely that one can apply it generously on pancakes or splash large scoops of it as topping on ice cream and enjoy it. Below, we shall take you step by step through the process of tasting a delicious ice cream with lots of hjortron topping. 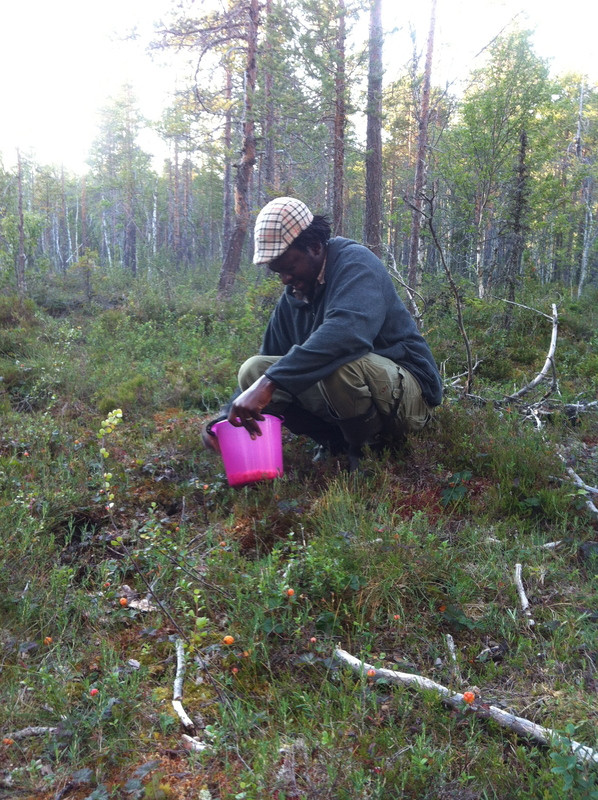 Then comes the careful process of ”rensa hjortronen” (selecting, removing all the tiny leaves, sticks and spiders that might have got into the harvest). 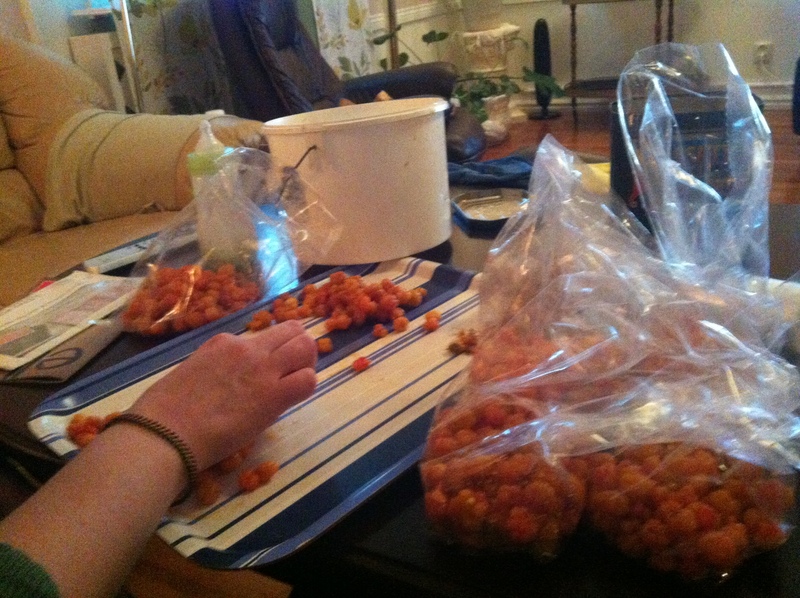 In the bags, a little bit of sugar is put to make sure the berries don’t freeze so hard when stored in the freezer. The welcome cake and party: Two days after arriving in our summer house at Umgransele, I had no idea something was going down…on a hushshhhhh. Stina finally told me, less than 24hours before, that the family had been organizing a welcome party for us. Aunts, Uncles and many family members and friends had confirmed they will be coming. I was more than surprised and a little bit anxious. It would be my first time to meet most of the guests, had only heard about some. more pleasant surprises…such a lovely cake, I can say. The day of the party was such a nice day, the weather was so good and the day was full of pleasant surprises, the biggest of all the cake. 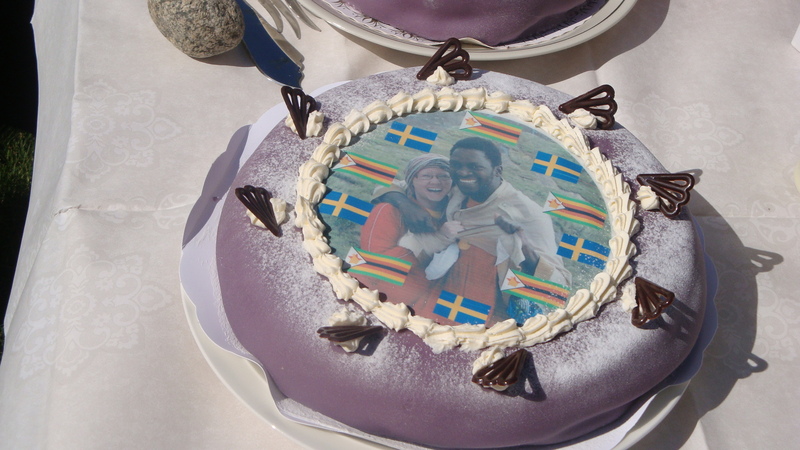 I loved the wonderful Swedish welcome from family and friends and was so happy to meet all of them. It was indeed a long and pleasurable day, made better by the Swedish summer sun that never quite sets. We were able to go to bed a little after 3am (still full daylight). The same morning after my surprise discovery about Our Welcome party, we got to work, setting up the place for about 40 guests or so…that done, this is how it looked. We waited for the guests to arrive the next day. So Nice! Awesome presents. A great surprise and a great present. The day we arrived in Stockholm and had lunch with friends, one of them gave me a really cool present, nicely wrapped. A book about Swedish traditions throughout the year, explaining each one and what usually happens on them. We really look forward to tracing each one as the year progresses. Stina’s present was a bag of Ostkrokar, her favorite. A great book chronicling Swedish traditions throughout the year…a must have for all . Thanks a million Charlotta. …and everybody in the whole world knows Stina loves Ostkrokar. Our beautiful and cosy Summerhouse. Stina has always told me how much she loves the summer house and how nice it is and I agree. This little “stuga”, or cabin in english is our hide out when summer comes. It is about 20km outside the city and has a forests and the big river within a 500 metre radius. We are here only in summer (about 3 to 4 months of the year – June , July and August) because the little cabin is not well insulated to keep the cold of the winter out. At times, the end of the summer holiday and the beginning of work pushes us to go back to the city. Equipped with a fire place and chimney, it is cosy enough to bear the worst of summer days, but once September creeps in, keeping the fireplace burning becomes and ordeal so we pack up, clean out and leave it until next summer. 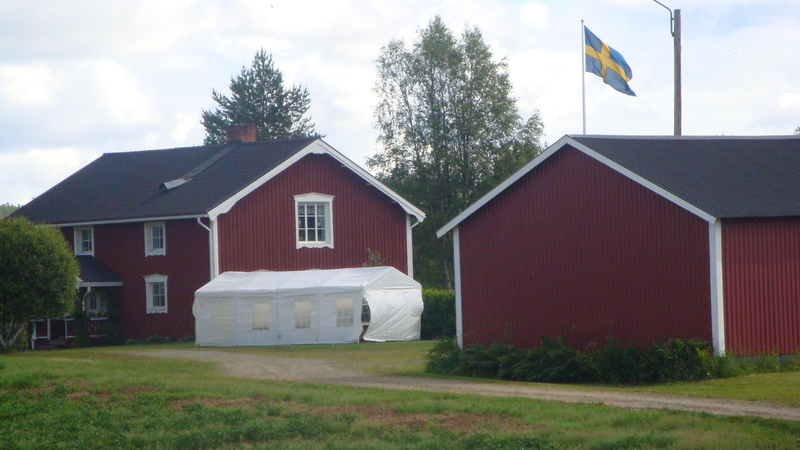 The summer house is a Swedish phenomenon. Quite a lot of people have summer houses, most are aimed to bring people closer to nature. 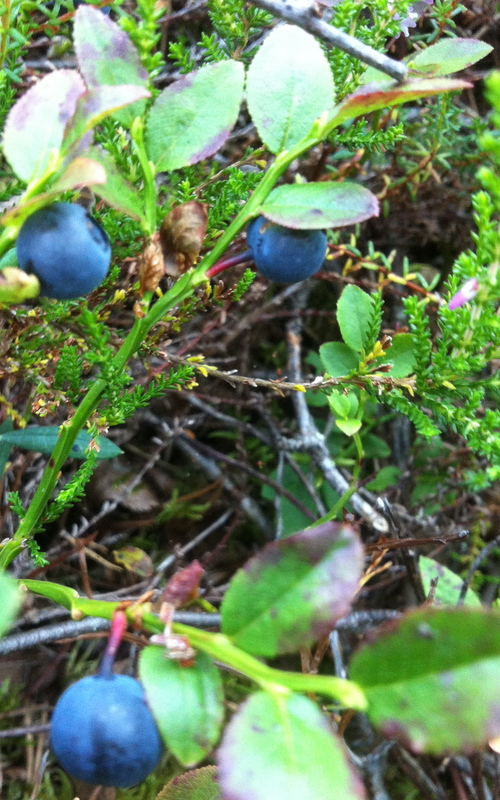 Summer activities like picking berries, scouting the forests and water related past times make summer houses a gem. Our cosy little summer house, a small place with a big and warm welcome. Oh, a familiar sight ! A hearty welcome. About a few hours off the plane, while Stina and I met up with our friends living in and around Stockholm for lunch, I had a great and warm surprise. I saw some birds. Not just any birds but the familiar kind that is so common in Sakubva, my home town and just about anywhere else I’ve lived. We call it the ”House-bird”. I felt really good afterwards and actually considered the possibility of some of these little birds migrating as far as Sweden in Summer. Nice! It gave me a warm welcome and a homely feeling to see this familiar sight. wow, a sight for sore eyes! Shocked and enlightened as i saw this little bird kind in Stockholm also very common in my home town Mutare, commonly called the House-bird there. Talking about public signs. Every country has different signs and symbols to communicate different messages to the public for example, Stop, No smoking, silhouettes of children crossing a street, or the precious sign we were now looking for, the male and female shapes indicating the bathroom. As we located the men’s and women’s rooms at the airport, the sign at the door was very new to one of us, ME. It surprised me. I had heard about it, but seeing it with my own eyes still felt strange. The sign of a man changing diapers. 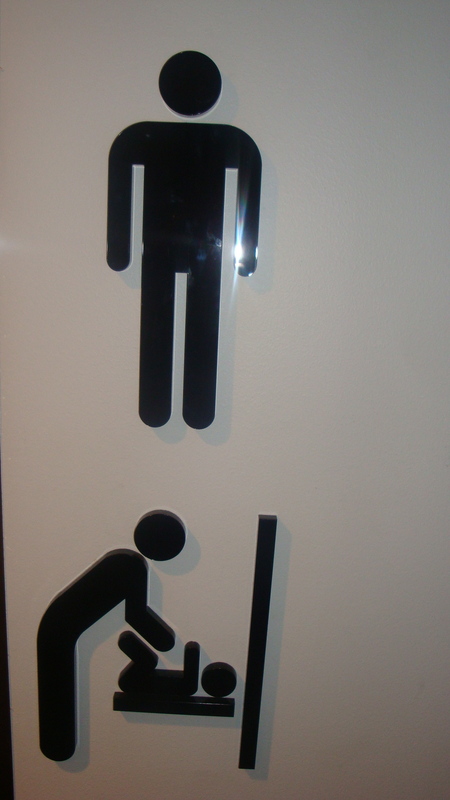 I must admit, I was a bit surprised by this sign on the men’s toilet at the airport, showing a man changing a baby’s diapers.